Eight years ago at the dusk of this day, the Good Lord called "Mighty John O'Connor" -- Lion of New York, icon and teacher of my boyhood, the last great leader American Catholicism has known, first and forever a good priest -- home to himself. As one of his aides confessed on a prior anniversary, "A day doesn't go by when I don't think about him." And, well, he's far from alone in that. How much he was loved... and how great was his love for us. As B16 ascended the altar of Yankee Stadium for the Mass there two Sundays back, a friend dropped a text asking if I was "seeing this." Now it can be told: I wasn't. As if the Main Event hadn't been enough chaos, I had to part from the festivities a couple hours early to head to Orlando. It's true: I covered my first papal visit and went to Disney World. Where's my commercial? But actually, no -- I didn't bail on Fluffy to spend time with Goofy. Before the visit's dates became clear, I'd already accepted an invitation to address the National Federation of Priests Councils on the occasion of its 40th anniversary. And being a good (albeit unwashed/ontologically-deficient) Philadelphian, nothing -- not even the Pope -- would keep me from honoring a commitment to 300 priests... and a joyous, humbling one at that. Anyway, what I otherwise would've been "seeing" (were it not for the usual airport-security chaos) was the opening hymn at the House that Ruth Built: "All Creatures of Our God and King"... O'Connor's favorite. And just hearing that it was being sung was, well, enough to do the emotional trick. But all this leads to today's public service announcement: folks, love your pets. Clearly, it's not St Francis Day... just a personal attempt at catharsis. 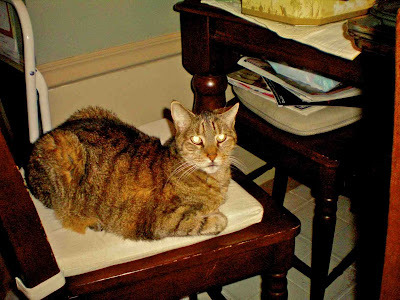 After a quick decline, yesterday we lost our beloved Obie -- my cat of 18 years -- to Feline Heaven. If God's good, though, he'll take her out of her boredom and slip her inside the Big Gates... because she never really had time for her peers and, in more ways than one, always wanted instead to be one of us. It's a blessing that these pages are unlocked; if they weren't, candidly, I'd probably be losing it right now. The Obster was -- and, really, it's even hard to use the past tense -- the only enduring pet we've ever had; our experiments with goldfish in my younger days never really worked out. And once she came around, she repeatedly tried to swipe 'em from the bowl for dessert, which brought our amateur aquarium days to an end pretty quickly. We first got her to combat an outbreak of mice in the house, a job she didn't end up doing terribly well (a record that, thanks to my Dad's ironic humor, earned her the nickname "Killer"). But we kept her anyway and are, even now, all the better for it. The most amazing thing -- and those of you who have cats (or, alternatively, don't like 'em) will understand -- she never hissed, not once. 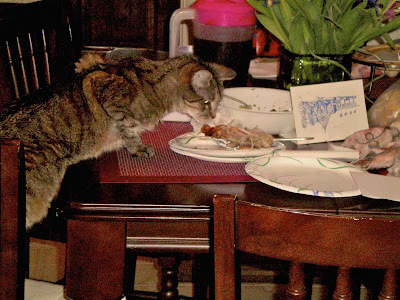 She wasn't even terribly frisky, aside from running the occasional laps across the living room for no perceptible reason, hanging from the screen-door in her lightweight days, or the customary paw-tap on the table when she wanted a piece of whatever was for dinner... that is, our dinner. All she enjoyed doing was jumping up on the windowsill to see what the neighbor-cats were up to, shooting out the door (or trying to) a couple times a day, mimicking my Dad's sleeping positions or taking a seat among the relatives at birthday parties, hoping to be included in the conversation. As she'd shed like crazy, she loved being brushed so much that it got to the point where the word couldn't be spoken but had to be spelled out -- and with time, even the mention of "the b-r-u-s-h" got her running in the speaker's direction as she knew what it meant. Talking it over all this with a friend, he quoted Will Rodgers' axiom that "If dogs don't go to heaven, then I want to go where they go." And you know, for more folks than each of us might realize, the feeling probably holds true, regardless of whether it's a dog, cat, bird, fish, frog, whatever. Just as life's in the little things, the companionship of a pet is really unlike any other... and all you need to understand that is the experience of them curled up next to you or on your lap... or coming home on that first night without them, trying to forget why they're not at the door, the food and water bowls removed from sight. 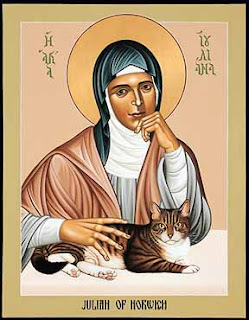 Needless to say, it's tough -- so tough that, during the visit, I failed to return a reporter's call for a piece about the Pope's well-documented love for cats in the fear that, given Obie's worsening health, the subject might be a bit too much to talk about on-record. But even more than my sister and me, who literally grew up with her, all this is toughest on the one we would've least expected when we got her: Dad. Thanks to his work schedule (and Mom's full roster of humanitarian efforts for anyone and everyone), he's spent practically every afternoon and evening with her, usually just the two of them. In the process, he ended up becoming fluent in Cat, just as she came to understand him, seemingly almost as well, if not better, than the rest of us. He said last night that it was easier for him to let her go than see her suffer any further... and, admittedly, I've never seen him as emotional about anything. Bottom line: there's a hole in the house today, one bigger than the couch and her usual seat at the table. No scratching on my door, no need to remember feeding times (which, in Ob's case, was more like every hour on the hour), no mention of "the b-r-u-s-h"... nor, most of all, the affectionate head-butts she'd make against your side just to remind you she was there... and looking for a stroke or two. Appropriately enough, this is the day when, more than any other, the world (or, more accurately, American television, the planet's racing fans and casual gamblers... to say nothing of a little place they call Louisville) stops for the animals. But whether they're running at Churchill Downs or just curled up on the floor, each are -- to use the words of the white-clad cat lover himself -- "creatures of [God's] will, creatures we must respect as companions in creation." And the funny thing -- the amazing thing, really -- is that, without a word, each doesn't just demand and teach us respect, but patience, compassion, companionship, the meaning and value of closeness... and, in the purest, most pretense-free sense, love. I'm not trying to be the next John Grogan or anything... but, gang, I never realized it'd be this hard. Love your pets, friends... you know how they love you. Egan to Rudy: "Outta Line"